Every now and then you need to see something a little bit weird to remind you that the world of theater is so broad and filled with a plethora of ideas. But then sometimes that weird piece goes a little bit too far that you question just about everything you’re watching. Enter Theater Reconstruction Ensemble’s Rhinbecca, NY. Conceived and directed by John Kurzynowski, the play loosely blends the absurdity of Eugene Ionesco with the thrill of Alfred Hitchcock to offer a tall glass of eccentricity. Known for dismantling and resembling classic texts and artists, Theater Reconstruction Ensemble’s latest offering may be their craziest yet. While you may ask yourself how exactly Hitchcock and Ionesco can converge at an exultant crossroad, Kurzynowski and his merry band of players manage to back it up. But loose is a very kind word when describing the inspiration. At the core of the play, Rhinbecca, NY goes on the search for self as Don, a stranger, comes to town searching for answers. As he arrives, he learns that the revered mayor has gone missing. Or has he? With a fast-talking ensemble, Rhinbecca, NY is a series of vignettes that come together to create a commentary on the absurdity of self. If you expect to see something in the normal spectrum of theater, you have come to the wrong place. Even on the spectrum of devised theater, Rhinbecca, NY seems to defy the norms. With an extremely thin through line to work off of, the piece can only be examined by each individual beat. With so much going on, some of it worked, a lot of it didn’t. From bits that included a description slinging of the missing mayor (that at times could have been describing Hitchcock himself) to a lip-sync extravaganza of the classic “Istanbul (Not Constantinople)” to a fourth wall shattering explanation of the action via program reading time, Rhinbecca, NY trampled through The Brick like a rhino on the loose. There's a natural quirkiness when it comes to devised theater. It's a journey to create and present the final product. It means something to the artists involved. But there needs to be an element of accessibility to the uninformed audience. To the people who are not privy to the creation process and the questions that arise in the rehearsal room. Rhinbecca, NY is an exceptionally interesting work of art. But do you leave pondering the questions the piece poses or do you question just exactly what you witnessed. The ensemble should be lauded for their ability to work as a unit and never falter. 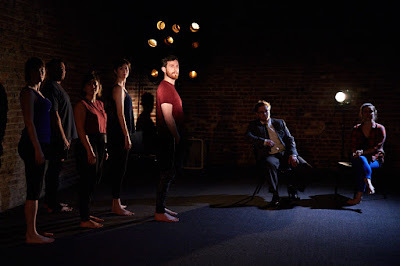 Comprised of Harlan Alford, Sam Corbin, Emily Marro, Anastasia Olowin, Jon Riddleberger, Lauren Swan-Postras, and Nathaniel Basch-Gould as Don, this ensemble was one. Though they were connected, Riddleberger and Corbin garnered just a little extra notice. Naturally, Basch-Gould was the primary focus of the piece and he lived up to expectation. John Kurzynowski guided his ensemble through this intricate world. No matter how you felt about the product, Kurzynowski brought bold choices to the stage and stood by them. Still, Rhinbecca, NY brought up questions that are bound to have interesting answers. Like the purpose of the pre-show announcement in the state that it was in, especially when the play restarts it’s different, and why did costume designer Joseph Wolfslau have the ensemble in workout attire. The open floor plan that Kurzynowski used for the piece allowed his ensemble use the entirety of the playing space but with such an elongated stage to work with, every seat had its woes. Nevertheless, you were never skimped on action feet away from you. The most incredible element of the production design was the lighting from Marika Kent. Kent offered a unique colorscape for each beat and made haze her best friend. As difficult as it may have been to see at times, the pay off was well worth it. Simply put, Rhinbecca, NY is for those looking for something out of the ordinary. 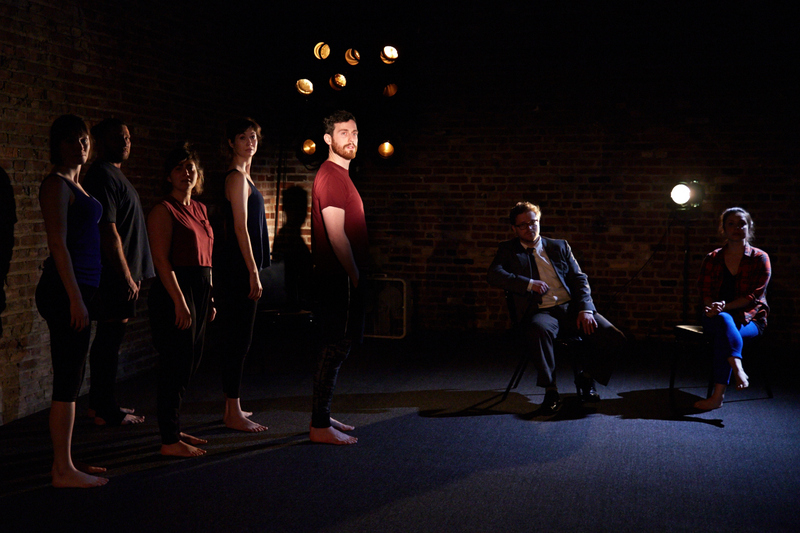 If you’re wiling to throw away your inhibitions and let the weirdness take you on a journey, Theater Reconstruction Ensemble will gladly guide you. But if you’re someone who is likely to question just the slightest thing, you’ll likely leave asking yourself why to everything.